Start a free trial of Sparkle Stories now! The United States celebrates Veterans Day this Saturday, November 11. 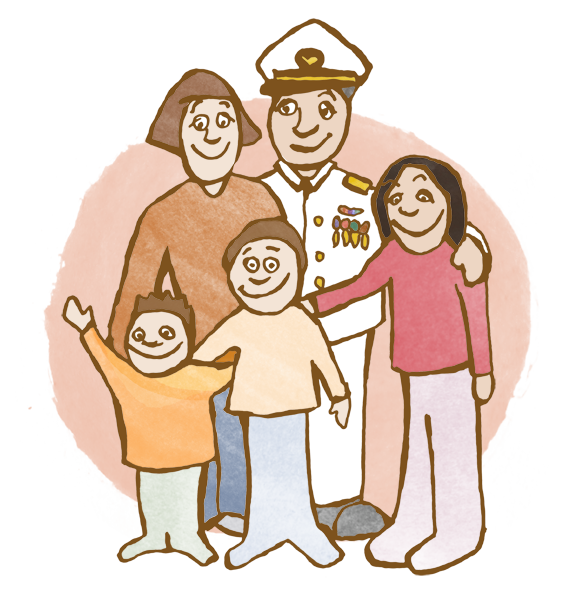 It is a federal holiday that has great meaning and depth for anyone in the military or part of a military family. For Americans who do not have an immediate relationship with the military, the holiday can be misunderstood or overlooked. I have not served in the military, nor have my parents, but both of my grandparents served in World War Two — one as a medic and the other as an air craft carrier radio operator. I have many friends who are currently serving or have served in the military, and my guess is that you do too. We want to celebrate our military families with an original story, and so we created “All Hands.” The story grew from conversations I had with many military families and the unique challenges they experience with deployment, regular moves, and financial insecurity. I hope this story can serve as an inspiration to reach out to our military friends and family — and to express appreciation and gratitude on this important holiday. It’s time for the Weaver family to move. They’ve been stationed at the Navy base in Mississippi for a little over two years and were fully expecting to be transferred to a new base somewhere else in the country. This is normal for the Weavers, but it doesn’t change the fact that it is difficult - especially for eight year old Derrick. Now he is faced with saying goodbye to his best friend Bobby and he doesn’t know what to say! Moving is always a challenge, and for the Weavers, it has the unique challenges that are familiar to all military families. This highly-reviewed organization offers care and support in myriad ways to veterans and active military. They also work directly in and with the VA. This organization’s mission: to assist support, encourage, teach and equip Veterans & Families to achieve integration and balance and lead flourishing lives. This organization helps veterans deconstruct their uniforms and turn them into paper, which can then use to make art or as writing paper. You can give directly to this U.S. Department – with the largest network of hospitals and services for military and veterans. David Sewell McCann fell in love with spinning stories in first grade – the day a storyteller came to his class and captured his mind and imagination. He has been engaged in storytelling all of his adult life through painting, film-making, teaching and performing. Out of his experience as a Waldorf elementary class teacher and parent, he has developed a four step method of intuitive storytelling, which he now shares through workshops and through this website. Sign up to stay updated with limited offers, sales, and other great Sparkle Stories news. All blog content is connected to audio stories, and the stories inspire the crafts. Expand your learning by signing up for Sparkle Stories.